Royal Terence Ivey (born December 20, 1981) is an American former professional basketball player who is currently an assistant coach for the New York Knicks of the National Basketball Association (NBA). He played college basketball for the Texas Longhorns before spending 10 years in the NBA. Ivey was born in Harlem in the Manhattan borough of New York City and started on the basketball team of Benjamin N. Cardozo High School, leading the team to its first PSAL championship. He attended Blair Academy for a post-graduate year. Ivey played college basketball at the University of Texas at Austin, in which he finished as the school's all-time career leader in games started (126). Ivey was selected with the 37th overall pick in the 2004 NBA draft by the Atlanta Hawks. On September 18, 2007, Ivey signed a one-year contract with the Bucks. On July 24, 2008, Ivey agreed to terms with the Philadelphia 76ers. On June 15, 2009, Philadelphia announced that Ivey declined the player option on his contract for the 2009–10 season, making him an unrestricted free agent. 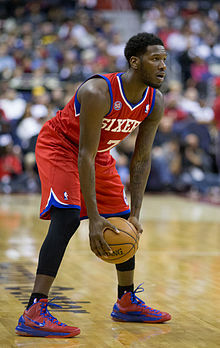 However, he re-signed with the 76ers in August 2009. On February 18, 2010, Ivey was traded to the Milwaukee Bucks along with Primoz Brezec in exchange for Jodie Meeks and Francisco Elson. On July 21, 2010, Ivey signed with the Oklahoma City Thunder. He reached the NBA Finals with the Thunder in 2012, but the team lost to the Miami Heat. On July 27, 2012, Ivey returned to the 76ers. On September 30, 2013, he signed with the Atlanta Hawks. However, he was waived on October 25. On January 16, 2014, he signed a 10-day contract with the Oklahoma City Thunder. On January 26, 2014, his 10-day contract expired and the Thunder chose not to offer him a second 10-day contract. On January 29, 2014, he signed with the Guangdong Southern Tigers of China for rest of the 2013–14 season. On September 29, 2014, Ivey was named an assistant coach for the Oklahoma City Blue of the NBA Development League for the 2014–15 season, effectively ending his 10-year playing career. On July 1, 2016, Ivey was elevated from a player development assistant with the Blue to an assistant coach with the Oklahoma City Thunder. During the 2011 NBA lockout, Ivey returned to the University of Texas to finish his degree in applied learning and development. ^ Dicker, Ron. "High School Basketball: New York State Championships; Rice and Cardozo Advance to Class A Final", The New York Times, March 27, 1999. Accessed September 14, 2018. ^ Behind the Numbers: Royal Ivey, NBA.com. Accessed September 14, 2018. "'In high school I wore number 12,' says Ivey, who led Cardozo HS in Queens to their first-ever New York PSAL title during his senior year before doing a post graduate year at Blair Academy in New Jersey." ^ "Bucks Acquire Ivey, Brezec from 76ers". NBA.com. February 18, 2010. Retrieved February 18, 2010. ^ England, Natalie (December 7, 2011). "Texas Ex Royal Ivey Uses NBA Lockout to Finish Degree". alcalde.texasexes.org. Retrieved May 8, 2012. This page was last edited on 12 February 2019, at 16:03 (UTC).